Wolverine Origins #50 Open Thread: Series Finale! In stores July 28, 2010. Strong finale or one last dose of melodrama from Daniel Way? And if you haven’t picked up the issue, make sure to read the preview, linked next the series title above. I am interested to hear everyone’s thoughts — pro and con (and respectful) as this major Wolverine series comes to a close. Being a long-time Wolverine fan, I have to say I was shocked at Seraph’s enormous stature. I mean — she’s a midget (tiny person?) in all of her previous incarnations. As for the issue itself — not sure if all the whiny psychobabble was necessary — but I especially look forward to hearing from fans of this run and how they felt the series wrapped up. 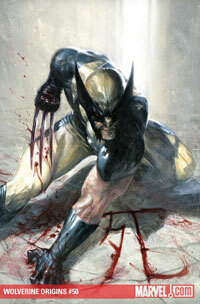 I’m content to follow the book’s message, put these 50 issues behind me, and embrace the Wolverine stories yet to come. well, it looks like it’s a mediocre ending to a mediocre series.. It was a pointless end to a series that was pretty much all forgettable. It didn’t answer anything and I don’t really see Wolverine just letting go of all his demons and the deaths of the women he’s loved because Fury confronted him about it. Like most of the series, i’m sure this issue will end up ignored in the years to come. Yeah, this series is an epic fail. The best hope is that it is indeed forgotten and fades away in infamy.